The futures of San Jose coach Todd McLellan and several key Sharks players are up in the air after another early playoff exit. 1. Doug Wilson's proclamation that he would recommend San Jose Sharks owner Hasso Plattner keep coach Todd McLellan did not stop any speculation. Initially, other teams looked at it this way: It gave the organization an out and put McLellan in an uncomfortable position. Historically, San Jose ownership doesn't meddle, allowing Wilson wide latitude in hockey decisions. But Plattner, who rose to the top of the flow chart in 2013, is a bit of a wild card, although it is believed he is not interested in any kind of long-term rebuild. How would he react to the crushing defeat? 2. Wilson said the Sharks will take a little time -- wise considering the current emotion. What's interesting is that, on Monday evening, another organization that would have pursued McLellan indicated it believed the coach will stay where he is. (Wilson declined comment for this blog.) Does make you wonder, though, if ownership's decision is already made. 3. So what will be the fallout in Silicon Valley? The thing about the Sharks is, it wouldn't be very hard for a trade to make them worse. They haven't made the Stanley Cup final, but if you were to rank the NHL's best organizations, they would be pretty high for good reason. 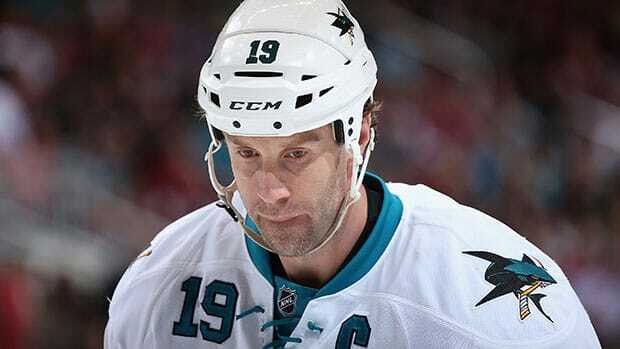 Let's say, for argument's sake, they decide to deal a cornerstone who is signed for next season (Logan Couture, Patrick Marleau, Joe Pavelski, Joe Thornton, Marc-Edouard Vlasic). Equal value will be tough to get. 4. According to a couple of other teams, Wilson has shown no inclination to deal his future, such as 2013 first-rounder Mirco Mueller or upcoming high picks. If you look back to Boston in 2010, the Bruins kept much of their core. The guys who went by the next deadline were Vladimir Sobotka, Mark Stuart, Marco Sturm, Blake Wheeler and Dennis Wideman. Who are the corresponding moves here? That's the key. 5. You also have to believe McLellan staying leads to deep conversation about goaltending. Can he stick with Antti Niemi after going with Alex Stalock in Game 6? 6. Trevor Linden is ready to begin his GM interview process, with Boston's Jim Benning widely considered to be the front-runner. Neither he nor the Bruins would confirm, but sources say the Canucks have permission to talk to him. Linden has said current assistant Laurence Gilman is a contender, and it's believed that Philadelphia's Ron Hextall and Nashville's Paul Fenton will be interviewed too. (Sounds like there are more, but the info is dicey, so no guesswork.) There will be some crossover between Vancouver's candidates and Washington's. 7. A thought from Kelly Hrudey: Linden's mentioned Boston's four-line approach as something he wants to emulate. Shawn Thornton is a free agent this summer. It would be an over-35 contract, which can be tricky, but that's an intriguing theory. (And that's all it is, a theory.) Kelly gets 1/30th of my pay this week. 8. Nashville's David Poile said after the season Shea Weber will not be traded. Asked how much the organization discussed this internally, Poile said, "We don't... When we decided [to match the offer sheet], we made a 14-year commitment." 9. There's another reason: "Shea Weber is someone other players want to play with," Poile said. It's clear he believes the Predators are better positioned to find the scoring forward they crave with Weber, not without him. "We have [Pekka] Rinne and Weber. If we can get a forward along those lines, we're there." Not an easy task, but I can understand the thinking. 10. Poile said there's a strong physical comparison between Weber and Seth Jones. At 19, the WHL's Kelowna Rockets listed Weber at 208 pounds. He's now at 234. Jones, 19 years old at the start of this season, was 210. If he goes to 234-ish, that'll be fun for the rest of the Western Conference. 11. Pure speculation on my part, absolute guesswork: Paul Holmgren said this week one of the reasons Vincent Lecavalier struggled is because Peter Laviolette, who recruited him, left, and Lecavalier wasn't a fit in Craig Berube's system. Is there a trade fit now that Laviolette is in Nashville? Flyers would probably have to eat a good chunk of his salary, but Holmgren and Poile have a history of getting deals done. 12. If Ron Francis becomes Carolina's GM one year ago, the Hurricanes probably take a run at Dave Tippett, who had a hazy future in Phoenix. Kevin Dineen, another former Francis teammate, gets a good look here, but, as has been reported, keep a close eye on Rangers assistant Ulf Samuelsson. Not sure about Ed Olczyk, but it would be no surprise if his brother, Ricky, ends up in Raleigh. (He was in Edmonton last season as assistant GM). 13. If Ed does leave the NBC booth, would it be to replace Brendan Shanahan as NHL discipline czar? 14. There was speculation that Mike Vellucci, who left OHL Plymouth to join the Hurricanes as assistant GM, would be a coaching candidate. But Vellucci said he wants to try management. He had a great line: "My daughter asked how I got an NHL job this year when we lost in the first round of the playoffs, and not last year when we reached the West final." Vellucci was also coach and executive of the year in 2013. 15. Did ask around for a couple of "different" coaching possibilities, guys who don't get mentioned much. Teams with current openings wouldn't answer, but there were a few suggestions. Willie Desjardins, who coached at AHL Texas, was a multiple mention. Also included: Tampa associate coach Rick Bowness, with five NHL lead jobs on his resume. And, Anaheim's Bob Woods, named because he's played a big role in developing some of the Ducks' impressive young defencemen. That group is coming pretty far pretty quick. 16. The final name was team-specific to Vancouver: Mike Johnston of WHL Portland. Linden made it clear the GM should hire the coach, but the two have a history. Anyway, just some different names. 17. Florida GM Dale Tallon said on Prime Time Sports last week that it's no guarantee the Panthers keep the first-overall selection in June. In a follow-up conversation, he was asked how far down the team would be willing to move. "We'll make the final decision in our scouting meetings, but probably between seven and 10," he said. What would it take for another team to get the top selection? "Also to be determined, but probably a young player who can help us." 18. Tallon was also asked if the Panthers have any untouchables on their roster. "[Aleksander] Barkov," he said, right away. "Our young core. [Jonathan] Huberdeau, [Erik] Gudbranson, [Nick] Bjugstad. I guess you always have to listen, but it would take a lot." 19. Dallas GM Jim Nill discussed the need for "a number one or two defenceman" in his season-ending media conference, but acknowledged that will be very difficult to find. The way things are shaping up, Nill and several of his peers believe there will be some good forwards available; also defenders known more for their offensive skillset. A defensive stud? Good luck. The market seems scarce. 20. Funny how the perception of a team changes in just a few months. If you'd asked the Stars about Trevor Daley and Alex Goligoski back in January, not sure how strongly the organization would have felt about keeping them. Trade rumours surrounded both. But several scouts noticed how much they raised their games in their first-round series. "They took a lot of the heat early in the season," Nill said. Will they start next season in Dallas? "Yes, they will be back. 21. There were a few Dallas players who impressed, showing more than expected against Anaheim. The Cody Eakin-Ryan Garbutt-Antoine Roussel line was at its annoying best, and much more disciplined than normal. Other coaches would point out during the season how that trio could be its own worst enemy, causing the Stars as much penalty trouble as it caused opponents. If this is a real change, that's a big step. 22. Other guys who stepped up included Vern Fiddler and Shawn Horcoff. Fiddler had an interesting season. Unhappy with his role early on, he asked for a trade. But things improved for him as we got deeper into the schedule, and he's a pretty big part of the group. He's unrestricted this summer. All Nill would say is he's made an offer. Just before he turned 30, Boyd Gordon, a similar player, got $9 million US over three years from Edmonton. Fiddler will be 34 on Friday, so I'd guess the biggest stumbling block might be term. 23. Like how both Ken Holland and Mike Babcock raised the bar for the Red Wings, saying the goal had to be more than just extending the playoff streak. It's transition time for Detroit. The organization will benefit from the experience their young players received this season, but Holland says a major question now will be if they can ease the wear and tear on Pavel Datsyuk and Henrik Zetterberg, just like those two did a few years ago. 24. "One of the reasons Steve Yzerman, Chris Chelios and some of our other veterans could keep playing was Datsyuk and Zetterberg took bigger roles and kept them going," Holland said. "[Gustav] Nyquist, [Tomas] Tatar and [Riley] Sheahan... Can they carry us on nights when Zetterberg and Datsyuk are not scoring?" Datsyuk played 20:16 per game. Zetterberg averaged 17 seconds more. If Detroit could get that number down two or three minutes per night, the organization would be very happy. 25. As for the next group of prospects, Holland indicated defencemen Mattias Backman and Xavier Ouellet may be NHL-ready. But QMJHL scoring sensation Anthony Mantha appears headed to the AHL, and it would be a surprise if they'd want goalie Petr Mrazek limited to 25 games backing up Jimmy Howard. Can't see Detroit offering Jonas Gustavsson more than a one-year contract, though. Might have to look elsewhere if he wants longer term. 26. One subject Holland politely refused to discuss: compensation for losing your employees to other clubs. (He will not allow contact with AHL Grand Rapids coach Jeff Blashill, who would be a big-time contender for open NHL jobs.) This is a big issue for several teams who strongly believe you shouldn't lose good people for nothing. This practice ended in 2006, when commissioner Gary Bettman had to negotiate Peter Chiarelli's move from Ottawa to Boston because Senator owner Eugene Melnyk was mildly unhappy with the whole thing. Bettman ended this. 28. Something else we might see at the June GM meetings: more debate about expanded video review. My bet: if we see it next season, it is only about disputed goals (eg. interference). Not high sticks or pucks over the glass. But I've been wrong before. 29. P.K. Subban's game continues to evolve. In Game 1 against Boston, he scored on a quick wrist shot from the point. Look at his 12 goals this year: six one-timers, three wrist-shots where he drove towards the net, and one slapper that was not quite a one-timer. That leaves a couple, both on these quick "wristers" -- the first of which was stopped by Jonathan Quick, but bounced in off Jarret Stoll. Those are two of his last three goals. Teams are crowding him, and even though he does a great job of getting it through, the quicker the better. He's definitely trying it more. 30. There was one Hotstove where I looked at my Twitter account after it was over and saw six racial slurs. Six! I remember how annoyed I was. If it became public, I can guarantee I wouldn't have been as gracious as Subban was -- and he received thousands. Good on you, P.K.